Mt. Tam Cheese for sale. Buy online at Zingerman's Mail Order. Gourmet Gifts. Food Gifts. 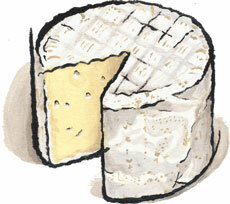 Our friends over at Cowgirl Creamery named their Mt. Tam cheese after nearby Mount Tamalpais, the iconic landmark of the Bay Area and symbol for Marin County, California. This petite round format has mountains of flavor as memorable as its namesake. The buttery golden color is a lovely contrast to the porcelain white rind. The flavor is mildly earthy, slightly mushroomy. The dense but ultra smooth texture is pure heaven.